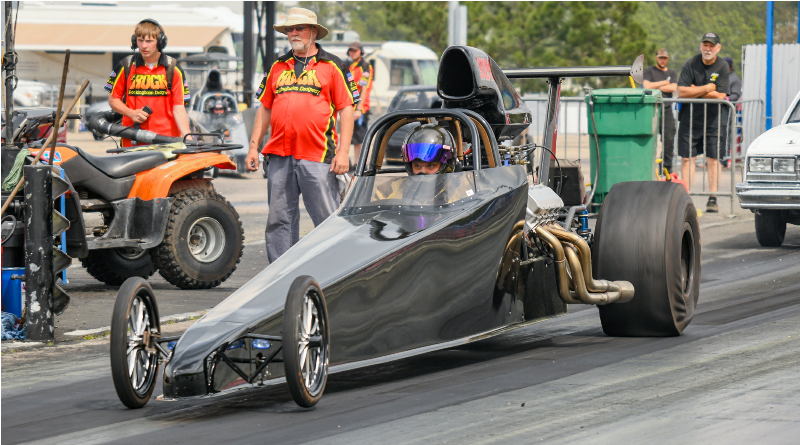 ROCKINGHAM – The Paschal brothers had him surrounded, but Lenoir’s Jake Woodring managed to overcome the odds Saturday and win the biggest share of the purse at the ATI Performance Products Top ET Challenge at Rockingham Dragway. Driving a black dragster largely devoid of signs and decals, Woodring outlasted more than 150 rivals to secure a $17,000 payday before track officials canceled Sunday’s final day of racing because of weather issues. The fact that three of the four cars in the Saturday semifinals belonged to either reigning Carolina Coalition Champion T.G. Paschal of McLeansville or his brother Michael, both multiple winners at The Rock, obviously didn’t bother Woodring. He used a .019 package (a .011 reaction time and a 4.588 second track time against a 4.580 target) to force T.G into a breakout foul in the semifinals and when he wound up facing him again after a sibling showdown in the other semi, he got a free ride to the big money courtesy of a foul start. As a result of Sunday’s rainout, the last big winner of ATI weekend was New Jersey veteran Chris DePascale who won Saturday night’s Gamblers Race, beating Thursday race winner Gary Ingold in the final. Like Paschal, Ingold fouled away his chances in the final, going red by .002 of a second. For DePascale, a two-time NHRA national tour winner in Super Street and the Super Street runner-up at the 2015 NHRA New England Nationals at Epping, N.H., it was just the tonic to make the trip home a little less tedious. DePascale beat Megan Lotts, daughter of Friday race winner Daren Lotts, in the semifinals while Ingold was dispatching Tanner Gray of Hope Mills. Round 4 – Matt Cooke, Hendersonville, .015, 6.066 on a 6.060, 110.00 mph, def. Jason Briggs, South Shore, Ky., foul; T.G. Paschal, McLeansville, .004, 5.514 on a 5.500, 125.40 mph, def. Chris DePascale, Parlin, N.J., foul (-.004); Michael Smith, Riegelwood, 1971 Chevy Nova, .014, 5.372 on a 5.340, 129.67 mph, def. Daniel Woodruff, Batleboro, 1969 Chevy Camaro, foul (-.002); Mark Arthur, Sandy Level, Va., 1970 Ford Maverick, .027, 5.698 on a 5.690, 119.70 mph, def. Michael Paschal, Greensboro, .037, 4.672 on a 4.660, 146.96 mph; Tommy Plott, Winston-Salem, .012, 4.614 on a 4.600, 147.81 mph, def. Bill Eyring, Lillington, 1982 Chevy Camaro, .010, 5.718 on a 5.690, 116.48 mph; Chad Duke, Wilmington, .001, 5.881 on a 5.870, 113.74 mph, def. Jimmy Broadway, Vanceboro, .013, 6.027 on a 6.020, 109.71 mph; Shawn Carpenter, Elm City, .009, 5.944 on a 5.930, 110.06 mph, def. Bobby Benson, Victor, West Va., .012, 4.693 on a 4.660, 146.50 mph; Jake Woodring, Lenoir, .014, 4.591 on a 4.580, 150.15 mph, def. Eric Aman, Clinton, .017, 5.851 on a 5.830, 116.22 mph; Andrew Davis, Fayetteville, .012, 6.449 on a 6.400, 101.49 mph, def. Anne Jackson, Florence, S.C., .041, 6.149 on a 6.070, 111.05 mph; Brandon Collins, Lumberton, .009, 4.702 on a 4.690, 144.41 mph, def. Cody Strickland, Raeford, .024, 4.533 on a 4.520, 151.36 mph; Tim Phipps, Kenansville, 1998 Chevy Monte Carlo, .007, 5.056 on a 5.050, 136.80 mph, def. Megan Lotts, Waynesboro, Va., .011, 4.723 on a 4.720, 145.39 mph; T.G. Paschal #2, McLeansville, .053, 4.524 on a 4.520, 151.60 mph, def. Terry Rucker, Benson, .056, 6.172 breakout on a 6.180, 106.97 mph; Michael Paschal #2, Greensboro, .018, 4.679 on a 4.670, 144.35 mph, def. Matt Cooke #2, Hendersonville, .003, 6.053 breakout on a 6.060, 112.31 mph; Jeff Parrish, Clayton, bye. Round 5 – T.G. Paschal, .008, 5.506 on a 5.510, 123.47 mph, def. Arthur, .023, 5.686 breakout on a 5.690, 120.43 mph; Cooke, .0117, 6.064 on a 6.060, 109.78 mph, def. Carpenter, foul; Phipps, .033, 5.058 on a 5.040, 136.81 mph, def. Davis, foul (-.005); Woodring, .021, 4.584 on a 4.580, 148.22 mph, def. Parrish, .022, 5.564 on a 5.540, 123.81 mph; Michael Paschal, .011, 4.690 on a 4.670, 146.40 mph, def. Smith, .002, 5.366 breakout on a 5.370, 126.72 mph; Plott, .029, 4.610 on a 4.610, 149.31 mph, def. Collins, foul (-.002); T.G. Paschal #2, .014, 4.880 on a 4.520, 109.55 mph, def. Duke, foul. (-.005); Michael Paschal, .003, 4.695 on a 4.670, 140.25 mph, def. Phipps, .028, 5.081 on a 5.050, 136.41 mph; Woodring, .001, 4.596 on a 4.580, 150.06 mph, def. Cooke, .0288, 6.055 on a 6.050, 111.62 mph; T.G. Paschal #2, bye. Semifinals – Woodring, .011, 4.588 on a 4.580, 150.45 mph, def. T.G. Paschal, .002, 5.496 breakout on a 5.510, 125.71 mph; T.G. Paschal #2, .000, 4.539 on a 4.540, 151.54 mph, def. Michael Paschal, .006, 4.664 breakout on a 4.670, 147.89 mph. FINAL – Jake Woodring, Lenoir, .012, 4.773 on a 4.580, 119.11 mph, def. T.G. Paschal, McLeansville, foul. Round 5 – DePascale, .010, 4.840 on a 4.820, 136.03 mph, def. Gray, .042, 6.622 on a 6.610, 102.88 mph; Ingold, .022, 4.710 on a 4.700, 145.56 mph, def. Plott, .024, 4.606 breakout on a 4.610, 146.62 mph; Lotts, .015, 4.718 on a 4.710, 145.75 mph, def. Blinson, .005, 4.890 breakout on a 4.900, 133.54 mph; Gray #2, .003, 6.628 on a 6.620, 102.94 mph, def. Dean, .013, 4.720 on a 4.710, 141.89 mph. Semifinals – DePascale, .024, 4.843 on a 4.820, 137.60 mph, def. Lotts, .010, 4.789 on a 4.710, 135.74 mph; Ingold, .004, 4.689 on a 4.700, 146.00 mph, def. Gray, .011, 6.607 breakout on a 6.620, 102.85 mph. FINAL – Chris DePascale, Parlin, N.J., .019, 5.357 on a 4.820, 95.07 mph, def. Gary Ingold, Raleigh, foul (-.002).